• We offer a variety of 13 pin Synth upgrades featuring RMC and Graphtech systems. • The Synth upgrade requires both a piezo bridge upgrade AND 13 pin system. both piezo and 13 pin system. • If your guitar already has an RMC or Graphtech piezo, click here or select '13 pin only' below. 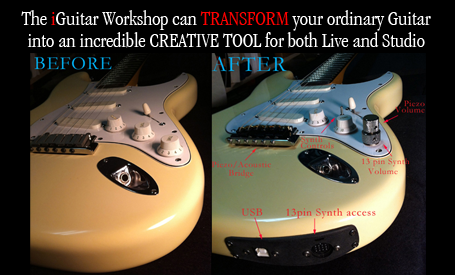 • The piezo acts as the synth/midi pickup and also gives you an incredible acoustic output. Standard Strat bridges, Tele Bridges, Wilkinson bridges, PRS, Parker, and a variety of bass saddles. • Graphtech features a new Floyd LB-63 bridge giving guitarists with Floyd style guitars access to the world of piezo and 13 pin synths. • Graphtech has a new Acoustic Ghost system for upgrading most types of steel string acoustic and nylon string classical guitars. Tele Bridges, Wilkinson bridges and a variety of bass saddles. Built-in RMC 13 Pin / Piezo for fast tracking with all guitar synths. You can purchase your upgrade online and we will email you an RA# and instructions to return your guitar to our factory for this incredible upgrade! Built-in Graphtech 13 Pin / Piezo for fast tracking with all guitar synths. You can purchase your upgrade online and we will email you an RA# and instructions to return your guitar to our factory for this incredible upgrade! Built-in Graphtech Floyd 13 Pin / Piezo for fast tracking with all guitar synths. You can purchase your upgrade online and we will email you an RA# and instructions to return your guitar to our factory for this incredible upgrade! If your guitar already has an RMC or Graphtech piezo, select this to add 13 pin only. Built-in 13 Pin / Piezo for fast tracking with all guitar synths. You can purchase your upgrade online and we will email you an RA# and instructions.